Winco LDS-3 2-Piece Stainless Steel Ladle with Short Handle 3 oz. 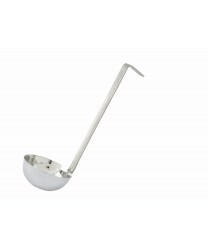 A ladle for every size, the Winco LDS-3 2-Piece Stainless Steel Ladle with Short Handle 3 oz. will perfectly dole out 3 oz. of condiments, dressings and gravy at cafeterias, salad bars and steam tables. Perfect for self-service or use behind the counter, this ladle features a hook handle so it can rest on the edge of a pot or crock, and it can be hung up after use for drying and storage. Winco LDS-0 2-Piece Stainless Steel Ladle with Short Handle 1/2 oz. Winco LDS-6 2-Piece Stainless Steel Ladle with Short Handle 6 oz. Winco LDT-4 2-Piece Stainless Steel Ladle 4 oz. Winco LDT-8 2-Piece Stainless Steel Ladle 8 oz. Winco LDT-6 2-Piece Stainless Steel Ladle 6 oz.